From Gerrit Rietveld and Alvar Aalto to Verner Panton and Eva Zeisel, from Art Nouveau to International Style, from Pop Art to Postmodernism, the history of the chair is so complex that it requires a comprehensive encyclopedic work to do it full justice. They are all here: Thonet's bentwood chairs and Hoffmann's sitting-machines, Marcel Breuer's Wassily chair and Ron Arad's avant-garde armchairs. Early designers and pioneers of the modern chair are presented alongside the most recent innovations in seating. "The ultimate reference book for anyone interested in knowing the what, where, who, why and how of the most iconic chairs from the last two centuries." 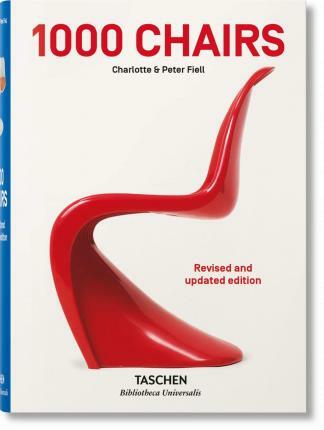 Charlotte & Peter Fiell have written numerous TASCHEN books, including 1000 Chairs, Design of the 20th Century, Industrial Design A-Z, Scandinavian Design, Designing the 21st Century, Graphic Design for the 21st Century, 1000 Lights, and Contemporary Graphic Design. They have also edited TASCHEN's Decorative Art series and the 12-volume domus 1928-1999.